I was amazed how a small country like Sri Lanka could offer so much variety! 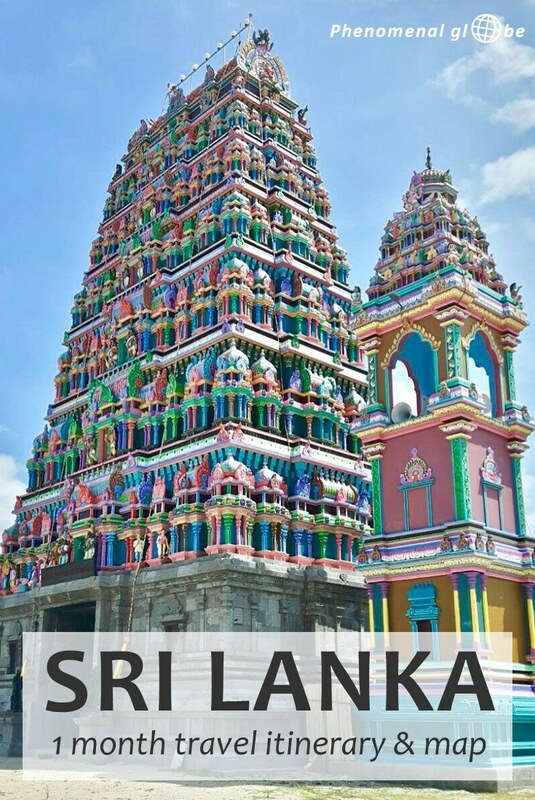 Sri Lanka has beautiful beaches, green mountains, even greener tea plantations, ancient and impressive Buddhist temples, colorful and detailed Hindu temples and much more. And all that on an island 4 times smaller than the U.K.! 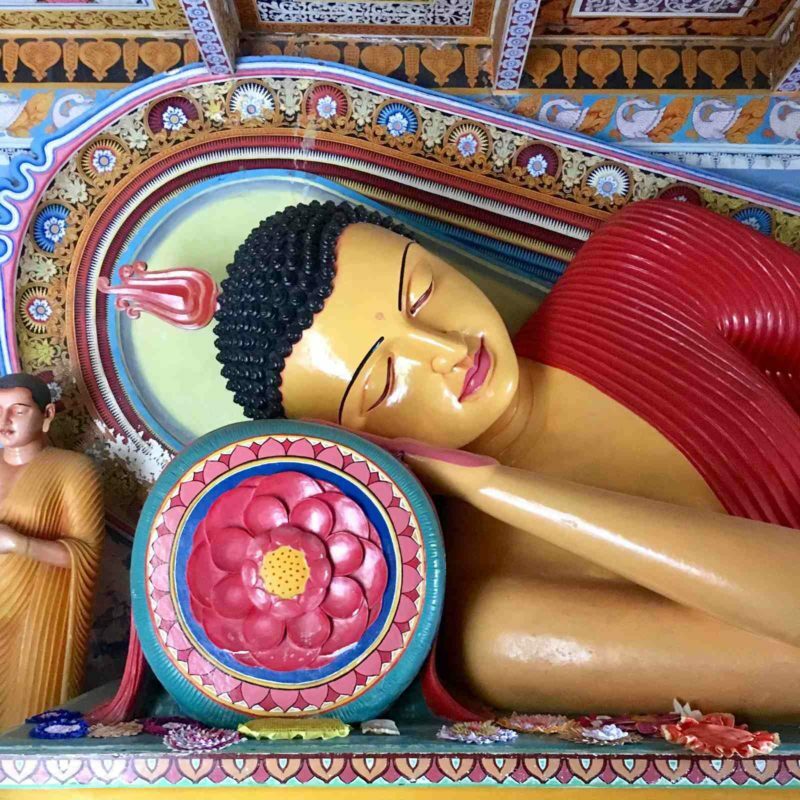 In our 1 month Sri Lanka trip we went city sightseeing in Colombo and Kandy, hiking in Ella and Haputale, temple hopping in Anuradhapura and diving in Weligama. • Sri Lanka budget breakdown ⇒ our average daily travel budget in Sri Lanka. 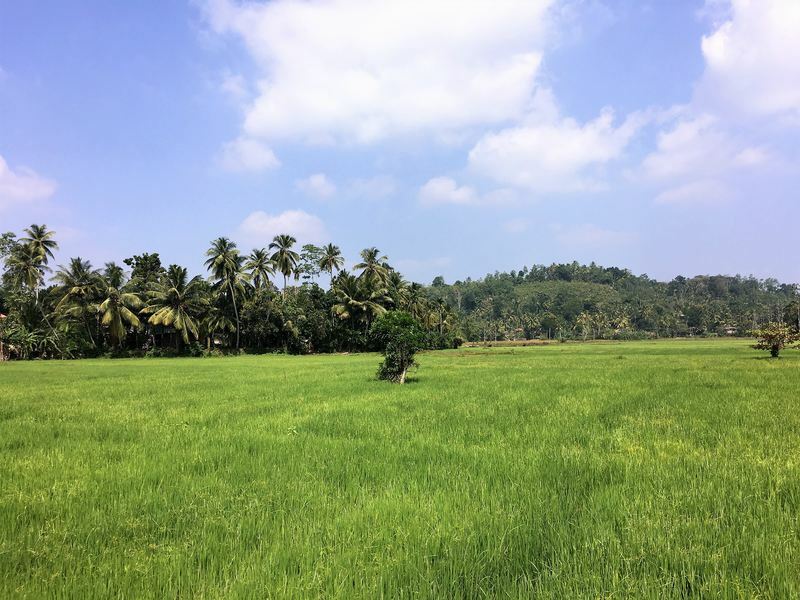 • Sri Lanka accommodation guide ⇒ where we stayed during our trip, pros and cons about those accommodations and prices per night. • Sri Lankan food ⇒ typical and delicious food I ate in Sri Lanka. • I traveled around Sri Lanka with my husband. • Our 1 month trip started and ended at Bandaranaike International Airport (Negombo). • We traveled from place to place by public transport. 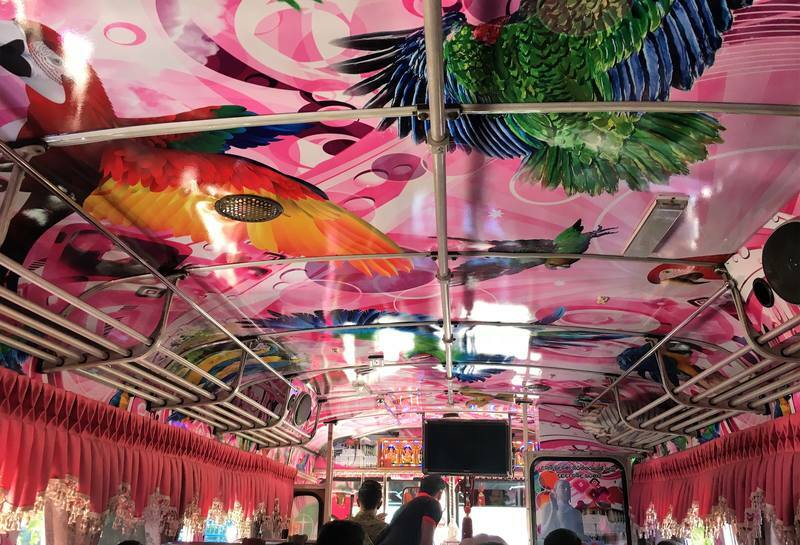 We took trains, tuktuks and a lot of colorful & loud buses☺. In this post I will provide as much detail as I can about how we got from from A to B. We arrived at Negombo airport in the middle of the night. Luckily the owner of our accommodation, Erandi Holiday Home, picked us up with his tuktuk and quickly drove us to his place. We were exhausted and asleep as soon as our head hit the pillow. • Hotel the Pilawoos ⇒ famous for its kottu, a typical Sri Lankan dish. We had it for breakfast and it was very tasty indeed! • National Museum ⇒ I personally didn’t enjoy this museum very much, it was being renovated and a large part of the museum was inaccessible. Also, the collection on display was limited, probably also because of the renovation. Entrance fee was 600 rupees per person. • Old Town Hall and Vihamaradevi park ⇒ lovely green park for a stroll. • South Beira Lake ⇒ we walked around this lake on our way to Galle Face Green. • Galle Face Green ⇒ a great spot to watch the sunset! • Fort Old District ⇒ we explored the historical district Fort. I especially liked the Clock Tower and the beautifully renovated Dutch Hospital. 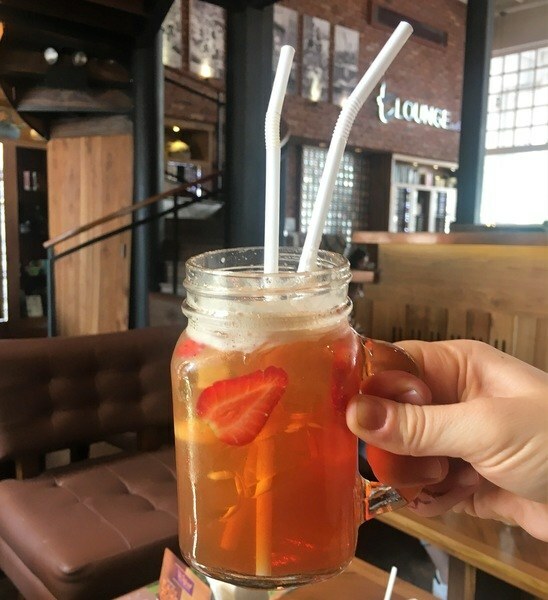 • The T Lounge by Dilmah ⇒ stylish cafe with delicious and refreshing tea! We stayed at Siebel Serviced Apartments for 2 nights (for more details and directions to this hotel, check my Sri Lanka accommodation post). 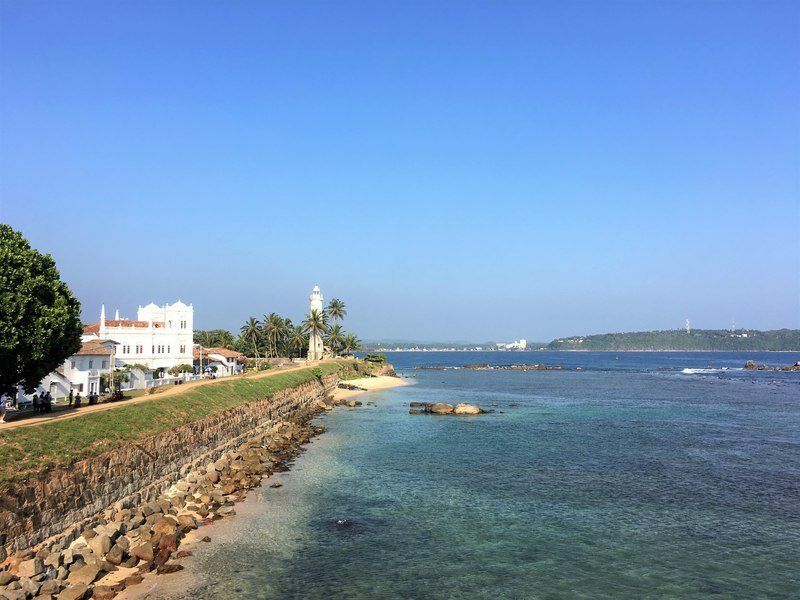 We spent 2 days in Galle and I liked this city a lot more than Colombo. It’s quite small and easy to get around on foot. • Around Galle ⇒ our second day in Galle we rented a scooter from the owner of our apartment and explored the area around Galle. We visited the Virgin White Tea estate (Handunugoda), drove through green fields and to the villages Hikaduwa and Unawatuna. We stayed at The One Apartment for 2 nights. More details in my Sri Lanka accommodation guide. I liked Weligama a lot, it’s a laid-back place with nice beaches and great for surfing. Surf lesson ⇒ our first ever attempt at surfing! We took a one hour lesson at ‘My Brothers School’ but didn’t pick a very good day, there were almost no waves! We did get to practice standing up and even caught a couple of very shallow waves! Diving ⇒ I love diving, it’s one of my favorite travel activities! We did 2 dives with Weligama Bay Dive Center (at Yala Rock and Patch Point). It was so good to be back in the water, I hadn’t dived since Cuba, but for Frank it had been almost 2 years since his last dive in Koh Tao. Mirissa ⇒ I was glad we were staying in Weligama instead of Mirissa, there were so many loud bars in Mirissa (I know, I’m old and boring?). Nevertheless, it was a nice place to spent an afternoon. We found a beach bar with lounge chairs, perfect for a drink and to watch the sunset. We stayed at Naomi River View Villa for 3 nights. I kept an eye on Google maps (offline, use GPS function) to check where to get off the bus for Talalla. The Wajirawansa Maawatha bus stop is a little past Talalla village, across the bus stop is a small road leading to the beach and several hotels. We stayed at Seaview Resort for 1 night. Safari in Udawalawe National Park ⇒ on day 10 we traveled from Talalla to Udawalawe Junction and booked a safari for the next morning (day 11) at our hotel. I had never been on a safari before and it was amazing! 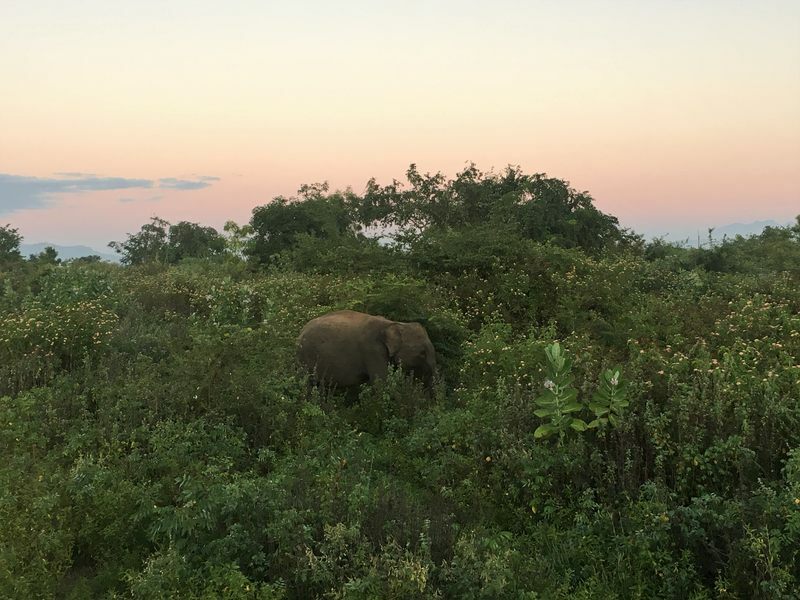 First we witnessed a beautiful sunrise and once the sun was up we saw lots of animals: elephants, buffaloes, deer, colorful bee-eaters (birds), peacocks, a big lizzard and… crocodiles! The safari was definitely one of the highlights of our Sri Lanka trip. Note: bring a jacket, I found it quite chilly in the early morning (5.30am)! Also be sure to bring some water and food. Our safari took 4 hours and I was very happy we brought something to eat and drink. We stayed at A to Z Family Guest Udawalawe for 1 night and also booked our safari there (4500 rupees per person). After the safari we traveled to Ella, a beautiful village in the mountains and my favorite place in Sri Lanka. We stayed in Ella for 3 days and did lots of hiking! 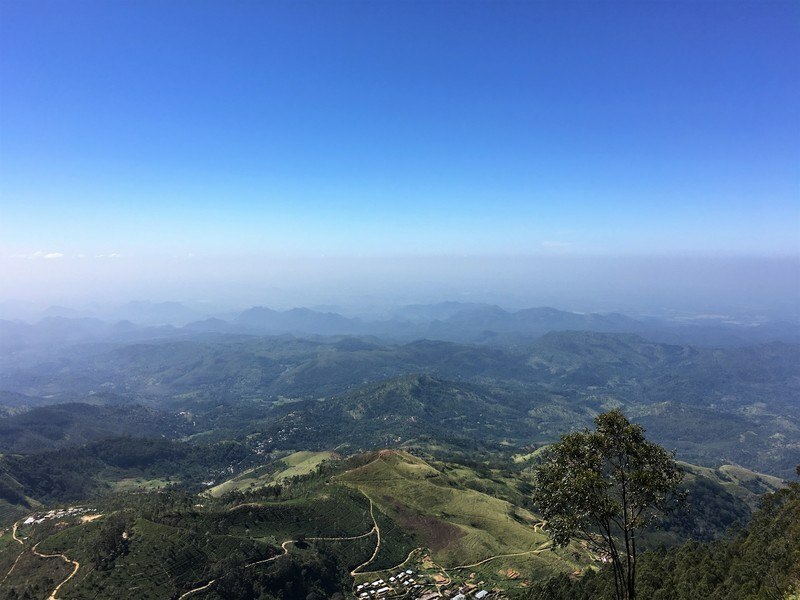 Little Adam’s Peak and Nine Arch Bridge ⇒ the views from the top of Little Adam’s Peak are phenomenal, on a clear day you can see all the way to the ocean on the South coast. It wasn’t that clear the day we hiked up, but the views were still amazing. From Little Adam’s Peak we walked to Nine Arch Bridge and arrived just in time to see the 10.56 train drive over the bridge. The total loop took us around 2 hours and 45 minutes. 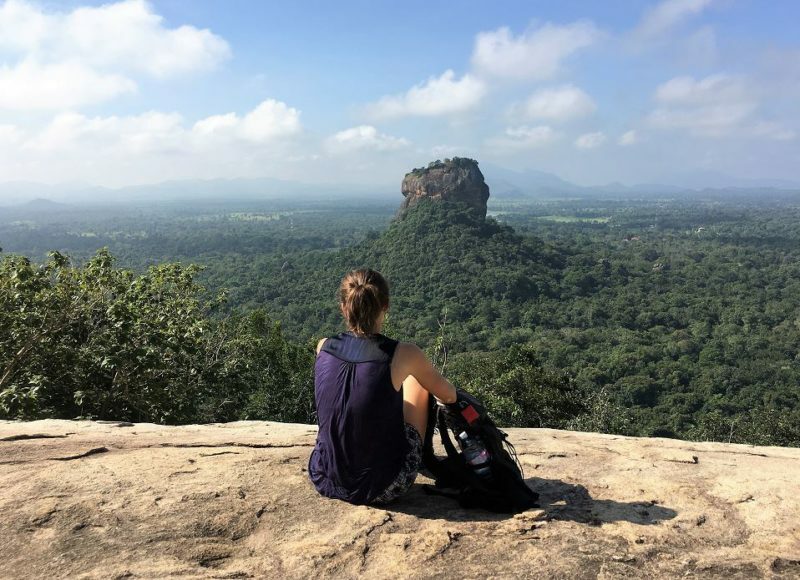 Ella Rock ⇒ this was another beautiful hike, but a bit longer and steeper than the hike to Little Adam’s Peak. However, it was definitely worth the effort, the views along the way and from the top are gorgeous! The return hike took us 3 hours and 15 minutes. We stayed at Mount Breezevilla for 1 night and at Ella Alpine Resort for 2 nights. The easiest way is to go directly from Ella to Haputale by train. 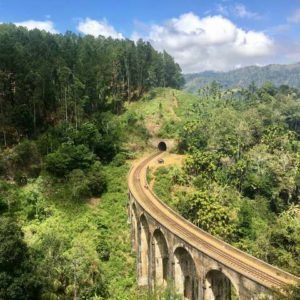 However, we wanted to cross the Nine Arch Bridge by train… And in order to do that, you have to travel by train from Badulla. Therefore, we took a bus from Ella to Badulla (1 hour) and boarded the train there. Another hour later we crossed the beautiful bridge and arrived once again in Ella. Needless to say we stayed on the train until we reached Haputale?. 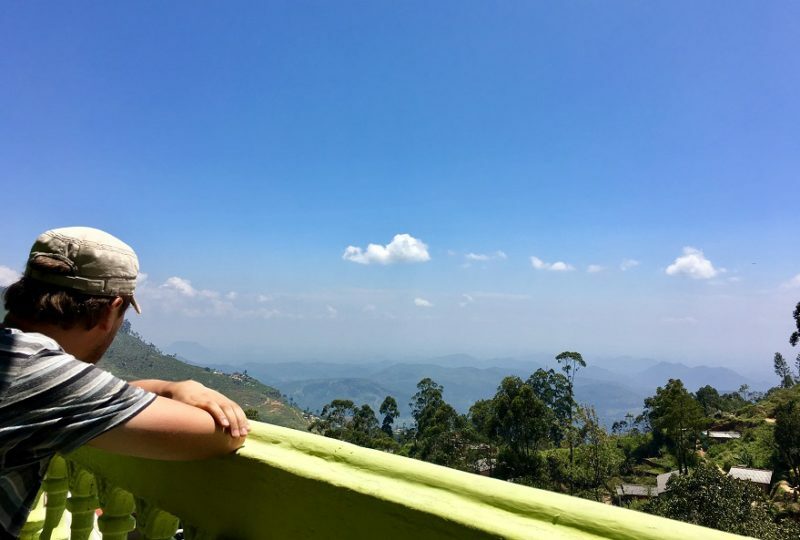 The trip to Haputale is an activity in itself, the train ride from Badulla to Haputale is one of the most beautiful ones in the world and it costs just 80 rupees (something like 50 cents in €/$)! Haputale itself is also very nice, the village is located on the ridge of a hill and there are amazing 360 views! We stayed in Haputale for 2 days and did some more hiking. Adisham Monastery ⇒ unfortunately we couldn’t visit this lovely looking monastery (it’s closed on weekdays) and only take a peak through the trees. 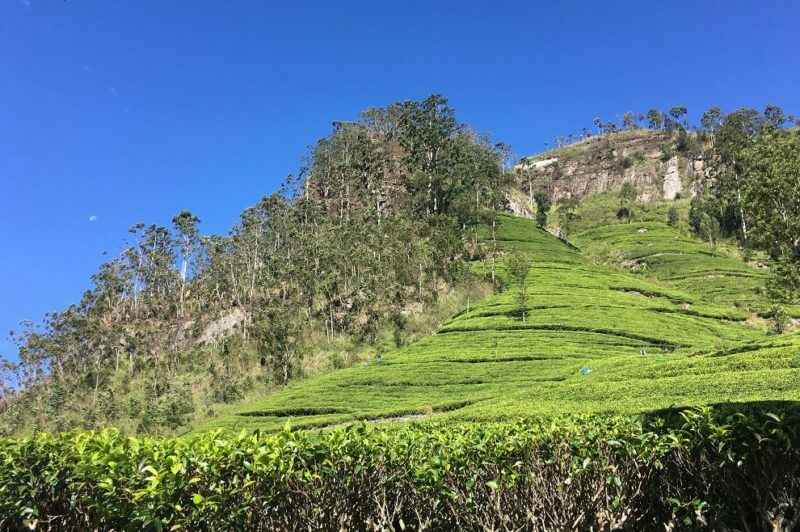 We hiked back to our guesthouse via the tea plantation. Lipton’s Seat ⇒ from Haputale bus station we took a bus to the Dambatenne Tea Factory (30 rupees pp). From the factory it was a beautiful 7 km hike through the vivid green tea fields to reach Lipton’s Seat. Fun fact: it’s called Lipton’s Seat because Sir Thomas Lipton used to sit here and look out over his estates. We stayed at Bawa Guesthouse for 2 nights. As there is no train to Nuwara Eliya we had to change to a bus at Nanu Oya station. We got out at the T-junction at Gregory Lake and walked to our accommodation. 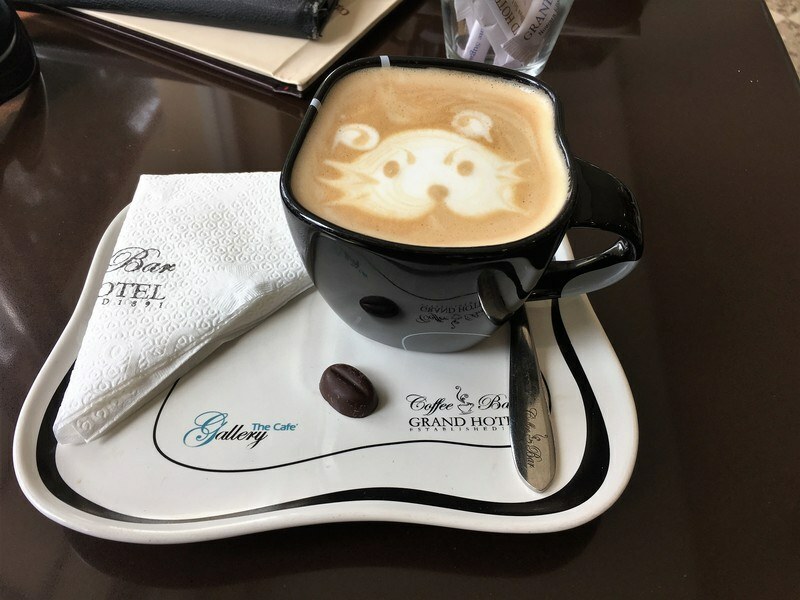 The Grand Cafe ⇒ I didn’t like Nuwara Eliya very much, but that was probably because it was grey and rainy… We spent most of our time indoors drinking cups of cute cat coffee. We stayed at the Cottage for 1 night, but I wouldn’t recommend this place (more info in the accommodation guide). Our original plan was to go to Dalhousie and hike Adam’s Peak, unfortunately the weather was terrible. It’s a lot less fun to hike in the rain so we went directly to Kandy instead. Walk around the lake and hike up to the viewpoint ⇒ we strolled around the Bogambara Lake and spotted many turtles and large lizards! A little uphill we found a nice viewpoint overlooking Kandi city center. 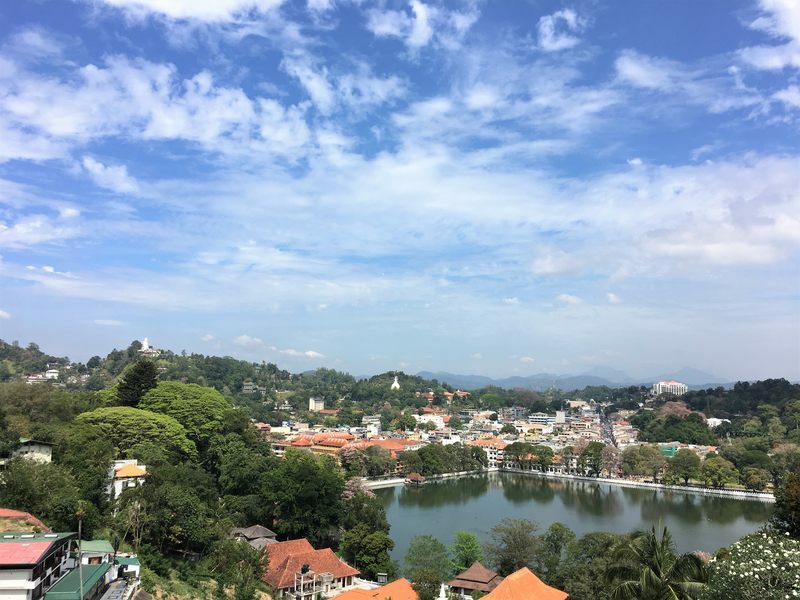 Sri Mahabodhi Maha Viharaya ⇒ instead of the famous Temple of the Tooth we visited this much quieter temple on a hill in Kandy. We stayed at the the Travellers Home for 2 nights. Walk around the famous Lion Rock ⇒ we arrived late in the afternoon and took a quiet stroll around the moat of the famous Lion Rock. We even saw a crocodile, very cool! We stayed at Pathum Homestay for 2 nights. 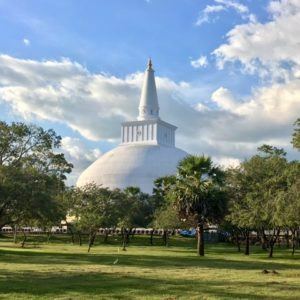 Anuradhapura temple tour ⇒ so many Buddhas and temples in Anuradhapura… We checked out 8 sites, including the famous Jaya Sri Maha Bodhi tree and beautiful white Ruwanwelisaya stupa. However, this colorful statue in the lesser known Isurumuni Viharaya temple was my favorite! We stayed at Hanoi Palace for 1 night but I wouldn’t recommend this place. Rent a scooter and explore! 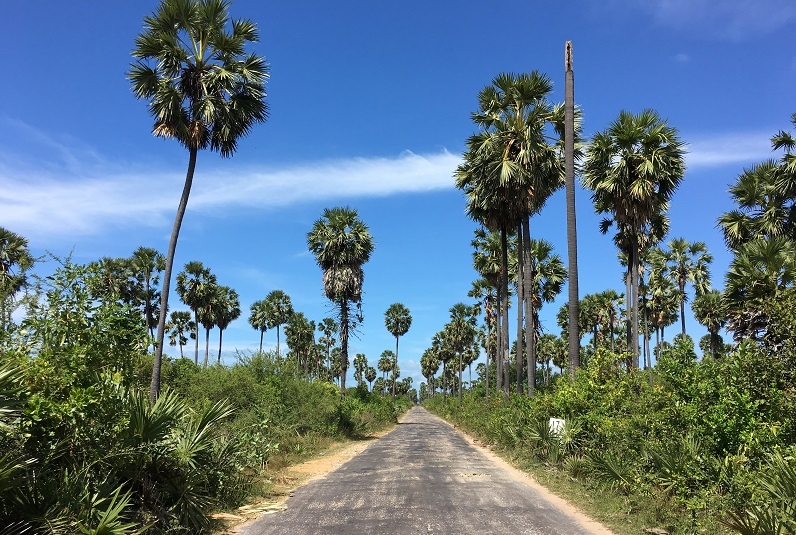 ⇒ not many travelers make it this far north but I am glad we did, Jaffna was one of the highlights of our 1 month Sri Lanka trip! We rented a scooter and drove around roads less traveled on the beautiful islands Velanai and Karainagar. Something went wrong with our booking at Hotel Blue Whale and we had to stay at the Park Hotel for our first night (not recommended). Luckily we could change to Hotel Blue Whale the next day. More scooter exploring ⇒ our accommodation was out of town so we rented a scooter for 2 days to get around. And to do some more exploring of the Kalpitiya peninsula! 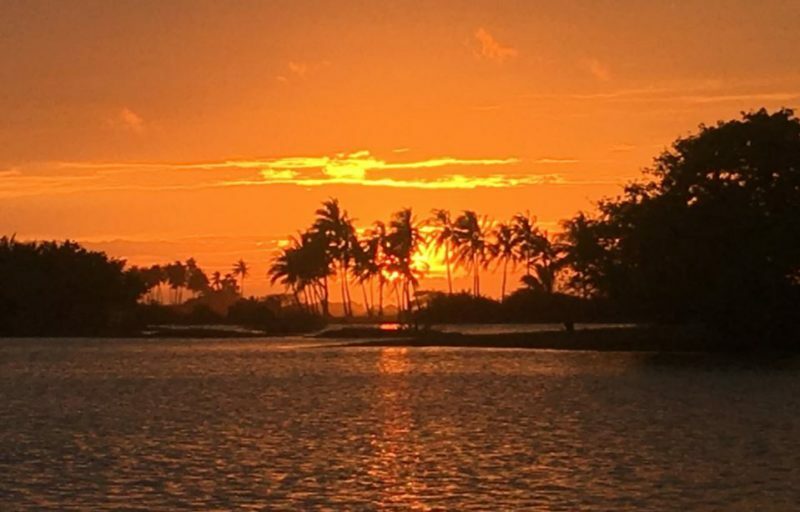 On our last day we watched the most amazing sunset… A perfect way to say goodbye to beautiful Sri Lanka! We stayed at Nethu Villa for 3 nights. Anyway, below you can download a table with the transport information and a table with the activities listed in this itinerary. 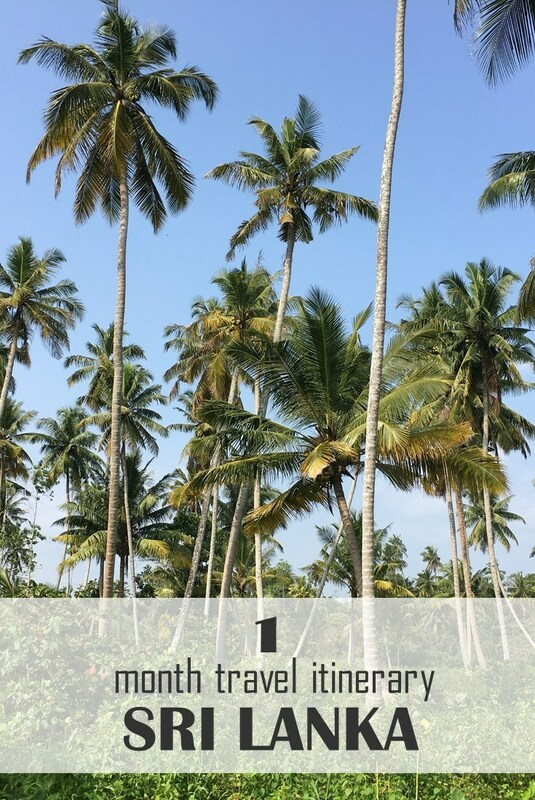 If you have less time available to explore Sri Lanka, check out this 2-week itinerary! 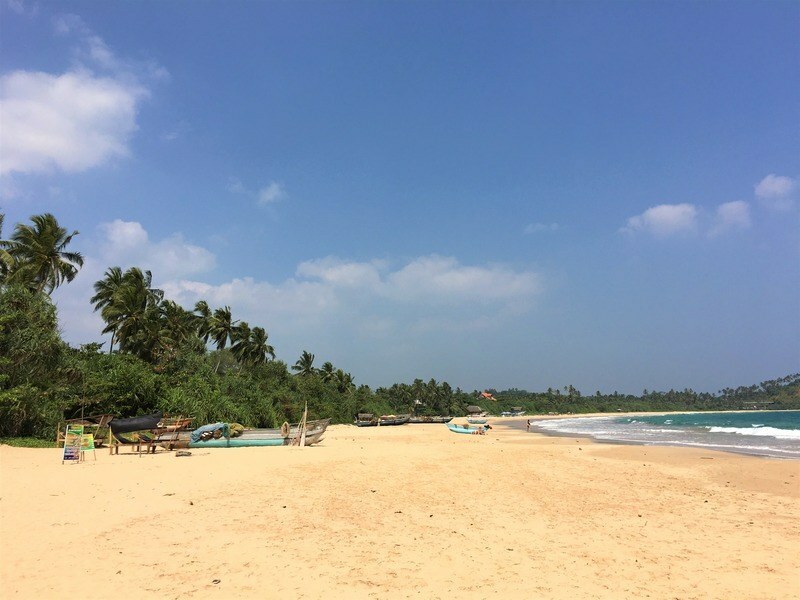 Planning a family trip to Sri Lanka? Read this guide how to travel Sri Lanka with a baby. Enjoy your trip to Sri Lanka! What an inspirational journey! Ella looks like a particularly stunning place to go hiking. I love hiking; I find that its a way of challenging my body in the best way possible. Thanks for sharing! Thanks Mark! Ella was amazing, a really beautiful village… I love hiking too, both for the exercise as well as for the amazing views! Great review Lotte! We stayed in Colombo for a month. LOVED The Commons; a fab breakfast spot where we feasted on American Brekky every Sunday. Amazingly tasty food. Sri Lanka has much to offer all travelers. Your itinerary looks amazing! I hope I have the chance to replicate it one day. And I love that you have included the routes for each place–so helpful. Thanks – looks amazing! We have only 2.5 weeks – what would you recommend in that time? I am planning about 21 days in Sri Lanka. Any tips on which cities I can skip or cut short? I’m sure you’ll love Sri Lanka, it’s a beautiful country with very friendly people and delicious food. If you have 3 weeks you can see lots of things, but if I had to choose I would probably skip Colombo. It’s an interesting place, but still a big and busy city, I preferred the more quiet places in Sri Lanka. And instead of visiting Kalpitiya as well, I would only visit to the South Coast, the beaches there are beautiful too and are easier to get to. Thank you so much for your interesting blogpost! My boyfriend and I wil spend 1 month in Sri Lanka departing the 18th of January 🙂 I’m actually a little worried about the weather due to the fact that a cyclone just passed through the south of the island although it seems to be the best time to travel in Sri Lanka. It looks like you had perfect weather. When did you go there? I hope you and your boyfriend have a wonderful time in Sri Lanka, it’s such a fun and friendly country! We spent the entire month of February there so fairly similar to your travel plans. Of course the weather remains something beyond anyone’s control but usually your travel period should be dry and sunny:-). Hello, I have enjoyed reading about your experiences in Sri Lanka. You have included details that have been hard to find in other places. 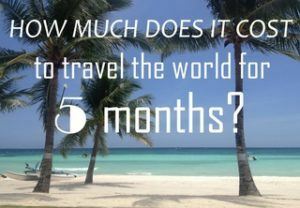 My partner and I have 35 days planned in Sri Lanka in Feb/March. We love hiking and plan to do as much as we can. I am wondering if you found the hills easy to navigate yourself or did you use a guide? Are there maps or easy to follow walking trails? I am always cautious when trekking in an unknown country. Did you learn about any other hikes that you would have like to go on if you had more time? Thanks, I’m happy to hear that! I’m sure your month in Sri Lanka will be amazing, it’s such a lovely country:-). About your questions, I booked my hotels 1 or 2 days ahead and never had any issues to find good accommodation. You can find all the places we stayed at in this post: https://www.phenomenalglobe.com/where-to-stay-in-sri-lanka-accommodation-guide/. Laundry can often be done by your accommodation, if not, it’s easy to find a place to do laundry pretty much anywhere in Sri Lanka! Have a great trip! Me and my boyfriend are planning on going to Sri Lanka in July. But we’re not sure if July is the best time to go. We don’t have an option to go in any other month, would you still recommend going? Hope to hear from you, thanks in advance! While I haven’t been to Sri Lanka in July myself I think it’s still very much worth a visit. in general your best bet would be to visit lots of places on the East Coast, which has the best weather between April and September. The cultural triangle should also be fine weather-wise. The West and South Coast tend to be a bit wetter during these months. Hope this helps, have a great trip! Wow! What an inspirational journey! 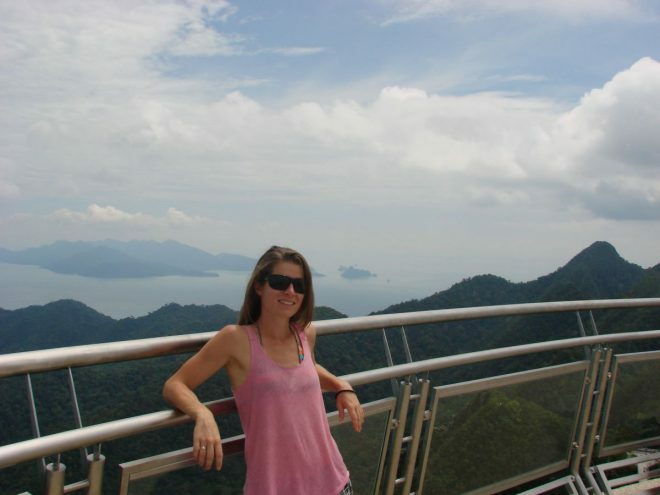 Fabulous blog; from accom, expenses, what to see and how to travel! My sister and I are going to Sri Lanka for 18 days from mid-May (can’t wait). We plan arrive Colombo, day trip to Galle, train to Jaffna, train & bus to cultural triangle, bus to Kandy, train to Ella then back to Colombo. Re bus travel we will probably have a small roll-on plus a modest back pack each – any difficulty with these on board? 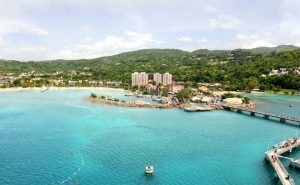 Re train travel – any need to book in advance during May? We prefer either 2nd or 3rd class reserved? Thanks, I’m glad you like my blog! Awesome you’ll be going to Sri Lanka, it’s a beautiful and colorful country. Your itinerary sounds great! Regarding your luggage, it can get very busy in buses and trains but the upside: they are never ‘full’. People will always make room for you, even when you think it’s not going to possible to squeeze one more person in. I wouldn’t worry about it! About the train travel, I’m not sure how you would go about booking the train. We just showed up at the train station and bought tickets for the same or the next day. I hope this helps, have a wonderful trip! I am planning to go to Sri Lanka this year from mid May too and im just wondering how was the weather when you went? I plan to stay for about 3 weeks and I really want clear skies and sun but I am afraid from reading online that there might be a lot of rain? 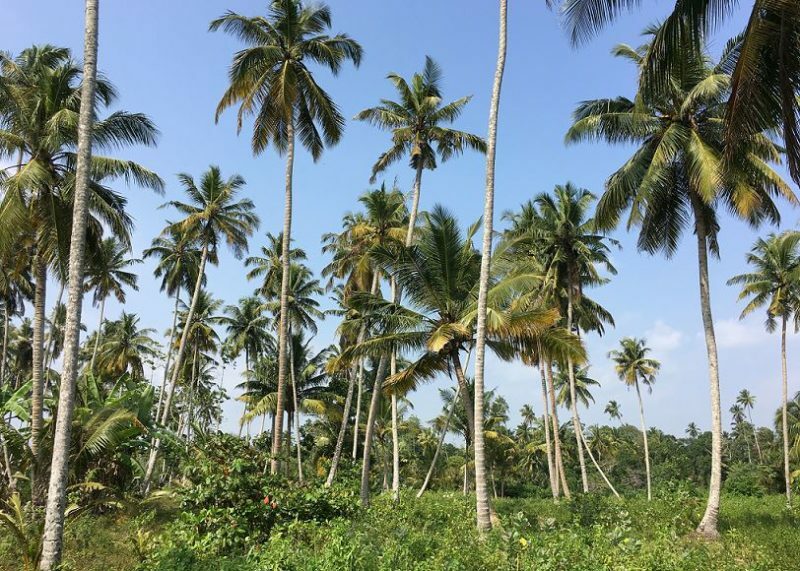 Thank you so much for sharing your one month Sri Lanka trip plan with us. I am going there for a month and follow your plan. I am also gonna start my Sri Lanka exclusive travel blog and I hope in month I will have enough time to explore Sri Lanka. Again thanks.